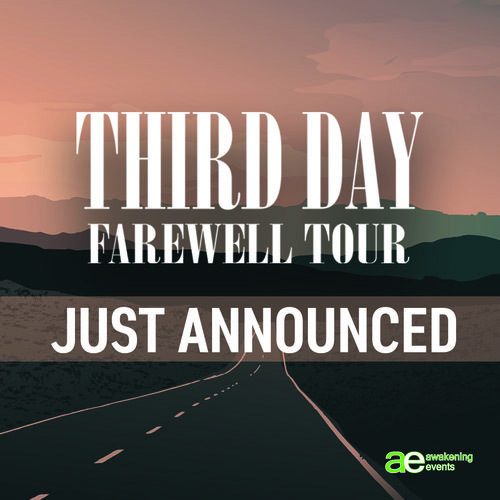 NASHVILLE, TN – March 2, 2018 – Four-time GRAMMY® Award-winning and multi-platinum selling band THIRD DAY will hit the road one last time this summer to headline their FAREWELL TOUR, which concludes an extraordinary touring career that spans 25 years and boasts legions of loyal fans from around the world. The tour, produced by Awakening Events and sponsored by Food for the Hungry, kicks off May 31, in Seattle, WA, and will visit 12 major US markets before wrapping up on June 27 in Denver at the iconic Red Rocks Amphitheater. “These last twenty-five years of THIRD DAY have been an amazing ride that we never in our wildest dreams thought we would experience,” said founding member and lead guitarist Mark Lee. “We know this is a season that is coming to a close, and we wanted to give our fans one more chance to see us perform live. The live show has been the core fan experience, and this tour will give us an opportunity to go out and say thank you to the fans who have always been so supportive of our music” said lead vocalist Mac Powell. The FAREWELL TOUR will feature a full slate from the band’s 31 number 1 radio singles, as well as new material from Mac Powell and the Family Reunion, new music from Mark Lee featuring stories from his book Hurt Road, and special guest artist appearances in all markets. Long known as Christian music's premiere live band, THIRD DAY has played for audiences reaching into the millions all around the world. THIRD DAY has been featured on top media outlets including "The Tonight Show with Jay Leno" (NBC), "The Late Late Show with Craig Ferguson" (CBS), CBS' "60 Minutes," ABC's "Nightline," USA Today, the New York Times, and even graced the cover of Billboard Magazine, which called THIRD DAY "one of the best rock bands, period." For more information, please visit www.thirdday.com or www.highgroundpr.com.